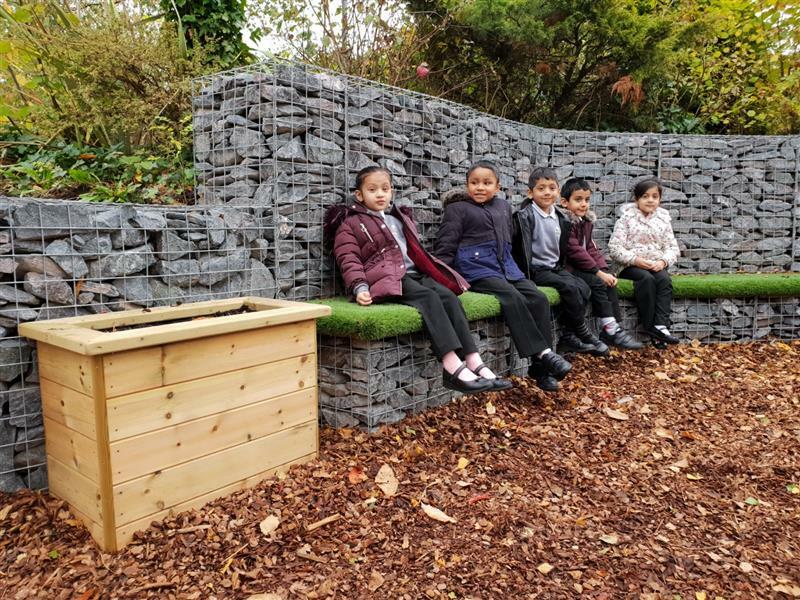 Pentagon Play have created a stunning, landscaped, natural play zone for KS1 pupils at Werneth Primary School in Oldham. Michael Bischof worked with the Lancashire primary school’s Principal, Conrad North, and his team to design a beautiful outdoor space that would connect pupils with nature and give them something to enjoy for every season. The Werneth scheme is unique. It covers a huge area along the entire length of the school, breaking up what was a grey, concrete landscape running by a roadside, and completely transforming it to create an inviting, naturally colourful oasis for the children. It's clever design divides the areas into linked zones, which children can travel through to discover something new and intriguing revealed at every turn. 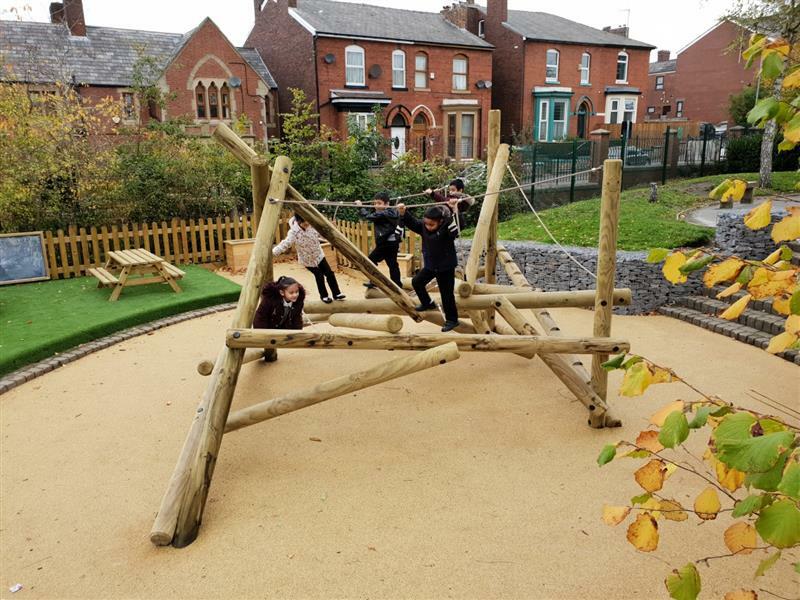 We worked hard with the school to make sure that we absolutely maximised potential for outdoor learning and play for this fantastic space. They had a vision for creating a natural play zone: a true “green space”, offering wonderful sensory benefits accessible to the children year-round. It needed to support active outdoor play and physical exercise too, with spaces for learning outside of the classroom. Once the design was agreed, our brilliant team went in to excavate and remove all the old spoil from the site including tarmac, stones, retaining timbers, brick walls and steel frames for a total “start from scratch” approach. We installed a secure, compact, stone subbase throughout along with stone filled gabion wall retainers. We flagstone capped the existing staircases to the area, built a new retaining wall around the proposed Gazebo site, and surrounded the outer edges with our Security Fencing for safeguarding. This type of fencing is popular because it is so secure yet un-imposing and allows natural light to travel through. Good surfacing was essential to ensure that the space could be used year round. We installed a selection of our superb Playturf Deluxe Artificial Grass, Wet Pour Earth Blend and Bark Flooring to break up the zones and add varied textures with a natural look and feel. Sign posted wooden Archways and Trellis were used to naturally break up the zones and direct children from one zone to another. Step out of the school building and follow a winding pathway to be greeted by a huge outdoor classroom area under the shelter of our outstanding Octagonal Gazebo. 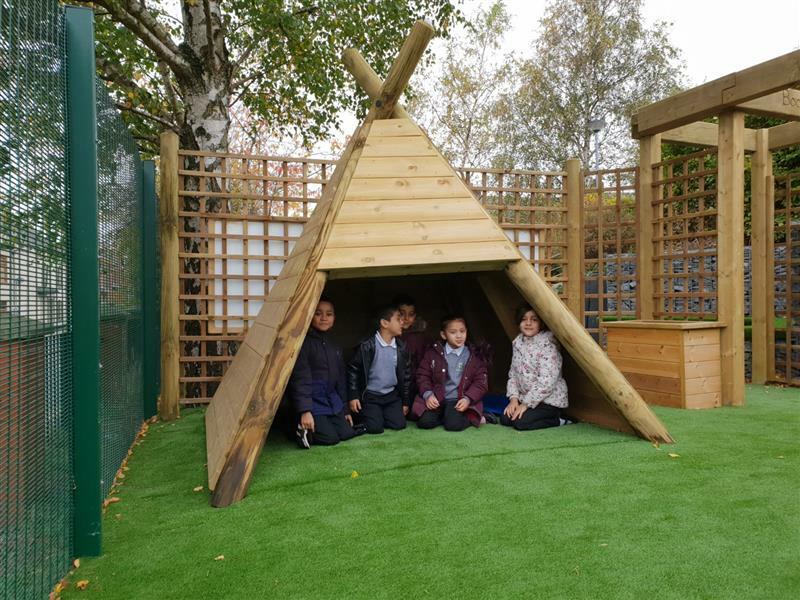 Installed with a Chalkboard for mark making and bench seating, it’s an ideal base for outdoor learning, creating a comfortable shelter from the changing weather with plenty of space to accommodate an entire class. When it’s not being used for outdoor lessons, it’s a great spot for relaxed social interaction, drama and role play and a base for tag games! 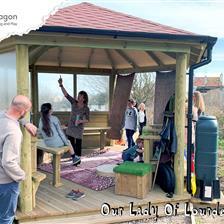 Take a look at our huge range of Outdoor Classrooms here. Equipped with two of our cosy Wigwams, Werneth’s den building zone is a delightful space for unleashing the children’s creative side. They have been using all sorts of resources to deck them out for role play! They offer a cosy shelter when quiet time is needed too. The Wigwams are installed on our Artificial Grass, which is free draining and soft to the touch, so they are comfortable to use throughout the year. 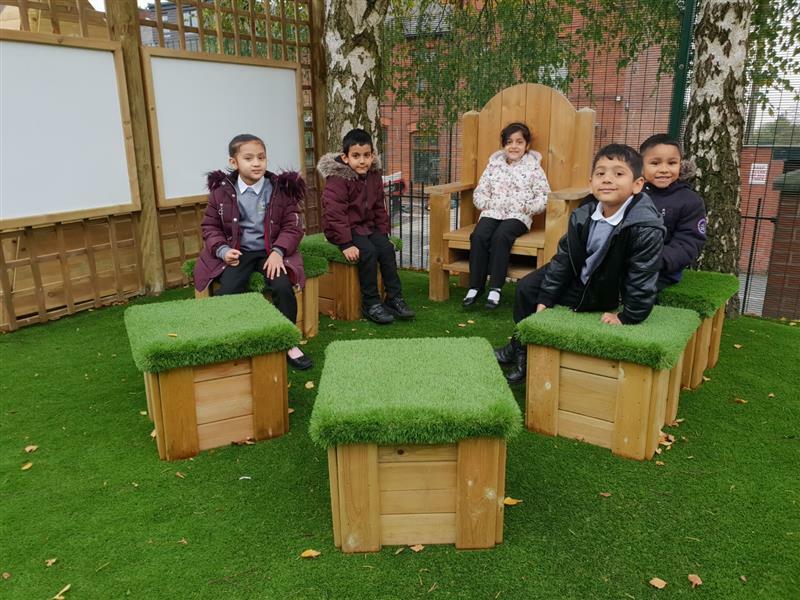 Teachers at Werneth have been capturing the children’s attention with some favourite stories read from our magical Storytelling Chair, while they sit comfortably listening and participating on our Moveable Artificial Grass-Topped Seats! Two Giant Whiteboards strategically placed on the adjacent Trellis provide a convenient, clearly visible surface for enabling language and literacy improvement. If you’re looking for Playground Seating solutions for your playground, visit our Playground Seating page here. Onto the bark flooring zone we have created a wildlife area, featuring our essential Bug Hotel accompanied by a Bird Box and Feeding Table. 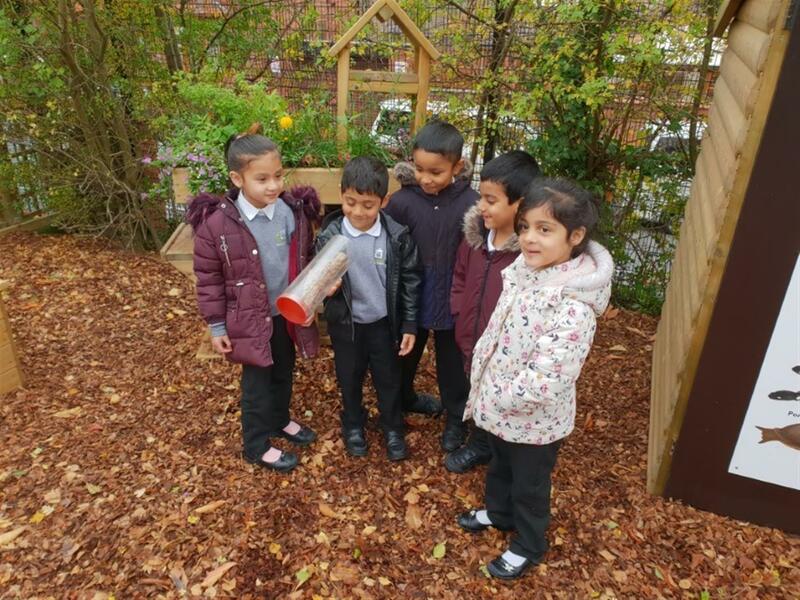 It’s a welcoming home for mini-beasts of all kinds, and because our design includes removable tunnels, the children can enjoy sliding them out and discovering up close for themselves all the weird and wonderful creatures that have taken up residence! Wooden Planters were installed for the children to fill with a range of sensory and seasonal plants. 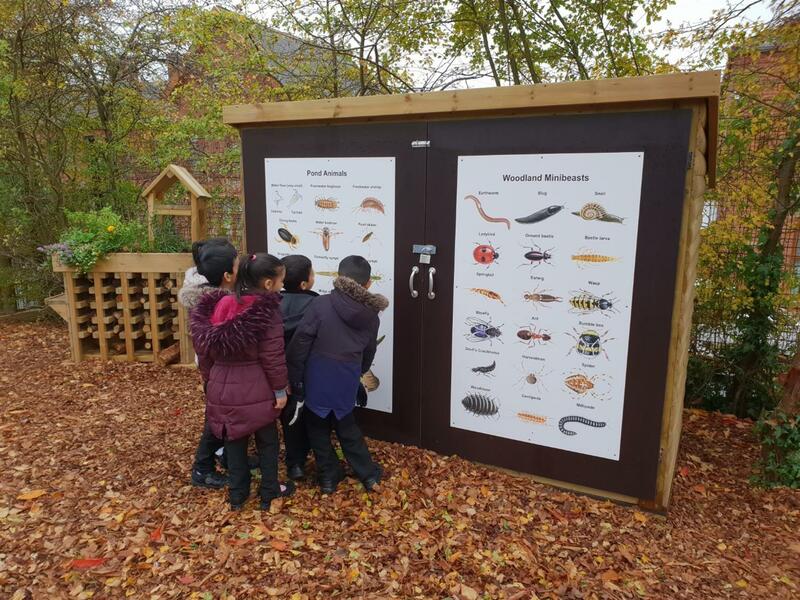 They will be able to care for them, explore them and enjoy hands-on cross-curricular learning, including topics such as life cycles, changing seasons and the environment. Planters near the Bug Hotel always help to attract birds and insects and create a haven for them to stay and be observed. We added a Recycled Composter to make this a truly green and self-sustaining area. Our spacious Walk-In Store with Nature Identification Chart ensures that there is plenty of space for the children to keep all of their gardening essentials. The useful and beautifully illustrated charts help children to identify and learn about all the different species that might visit their wildlife area. 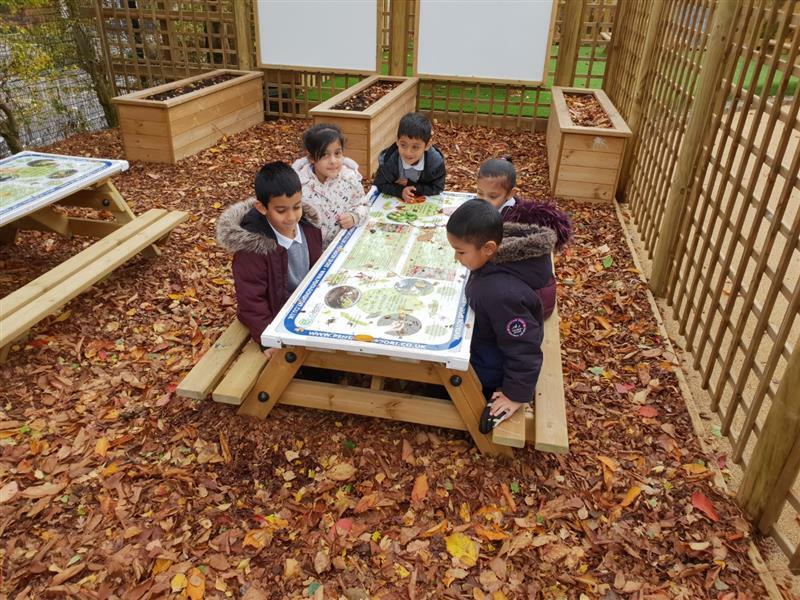 We have designed a great range of educational picnic tables so children have somewhere interesting to sit together outdoors. In Werneth’s wildlife area, we installed two of our Picnic Tables with Composter and Veggies Top to be in keeping with the theme. 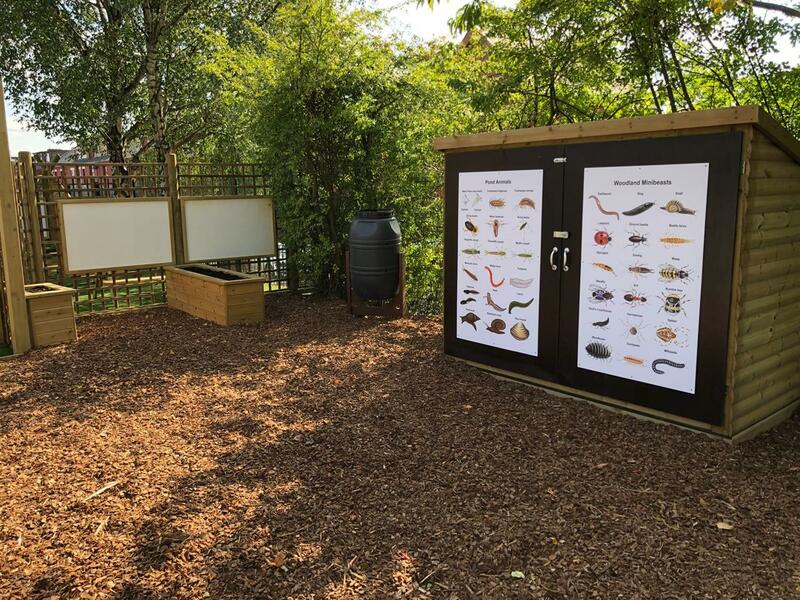 Two of our Giant Whiteboards, attached to the trellis, allow the children to mark make and note all of their discoveries and maybe even draw some mini beasts of their own creation! 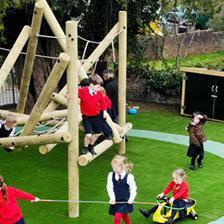 View more examples of our Natural Playground Equipment here. The children will step through an archway out of the wildlife zone and arrive at an exciting active play area at the end of the trail. Standing proudly on the Wetpour surface is our challenging Tryfan Climbing Frame: a log climbing frame featuring ropes and scramble nets with multiple entry points. It’s a brilliant, non-prescriptive piece of climbing equipment. The children love playing on it as they develop their physical strength, balance, coordination and motor skills at the same time. A step-up-to Artificial Grass area with Picnic Tables and Giant Chalkboards encourages the children to enjoy mark-making with large body movements. They can also sit down for a rest and enjoy a snack after all the running around! The entire development is interspersed with wooden planters, benches to sit and relax, and some beautiful, naturally growing, mature trees. 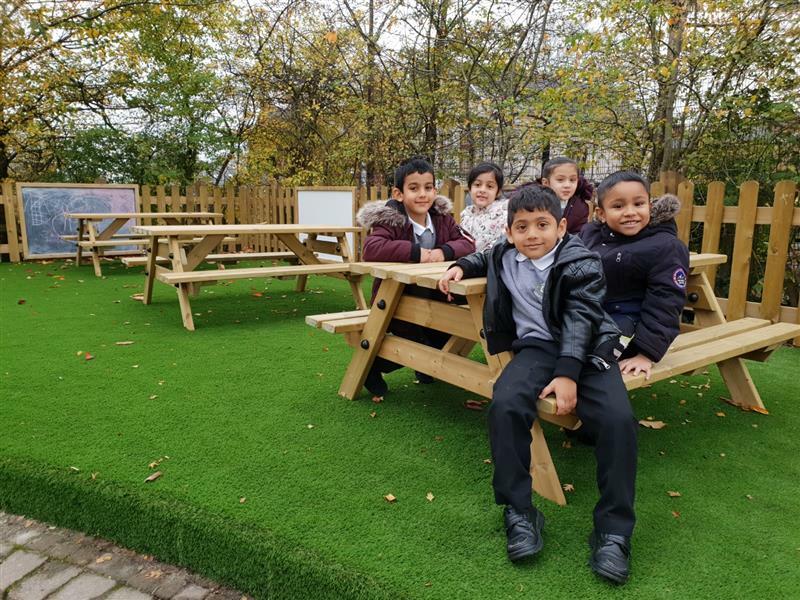 It really is an outdoor paradise for the children and we are delighted to see the positive impact that the new space is having at Werneth Primary. It was a true joy for us to create. View all of our exciting active play equipment here. 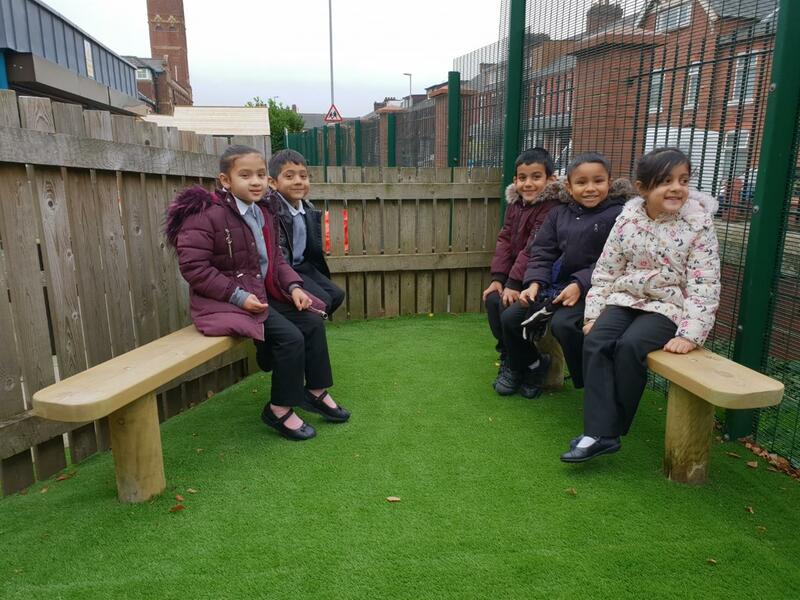 If you would like to transform your school’s outdoor space too, we would love to hear from you. 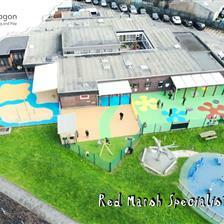 You can Contact Us Here for a free Pentagon consultation from one of our expert Playground Consultants.